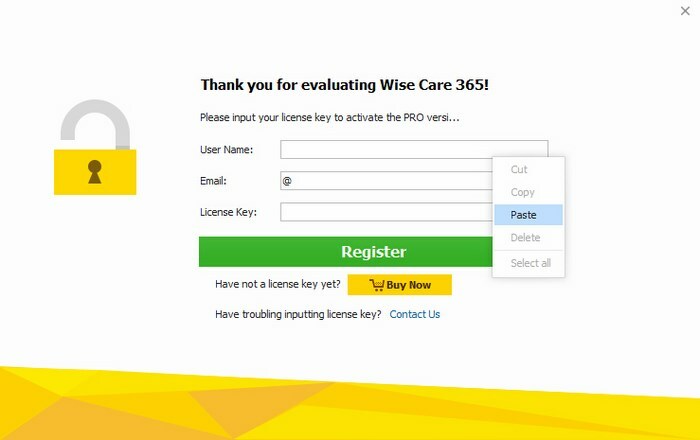 In order to help you find your answers regarding using Wise Care 365 in a more efficient way, starting from today, all the most frequently asked questions and their answers will be assembled here under this post. Please make sure you have searched in this post for your answer first before starting a new Topic. Unlimited topics will be added here until… Wise Care 365 is perfect and users are all familiar with it. Further questions/suggestions, feel free to contact us. 1. Why choose Wise Care 365? 18. 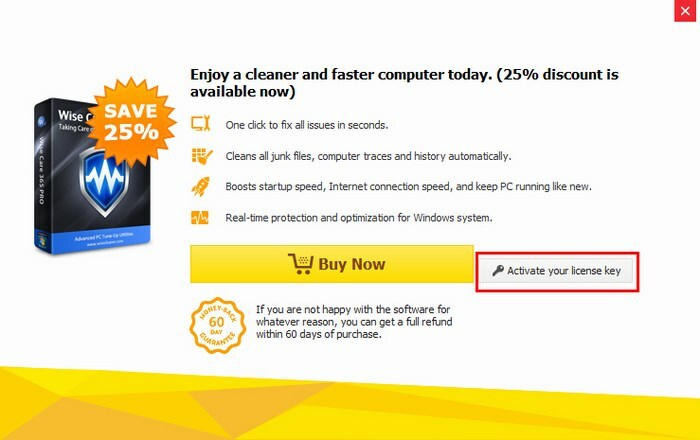 How to use the WiseCleaner coupon code? 19. 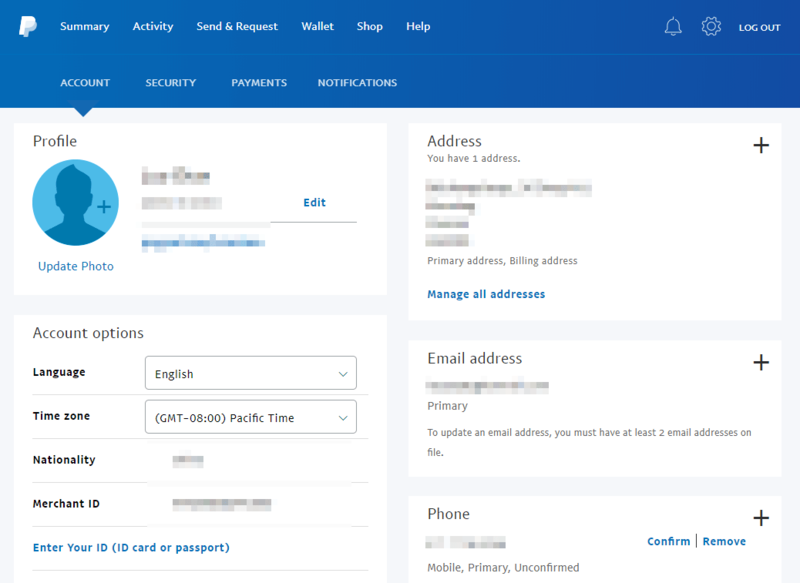 How to update my payment information? 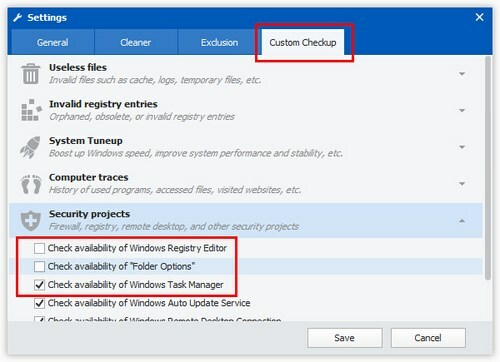 Fast: Using a high performance engine, Registry Cleaner in Wise Care 365 quickly scans your registry to find obsolete entries. 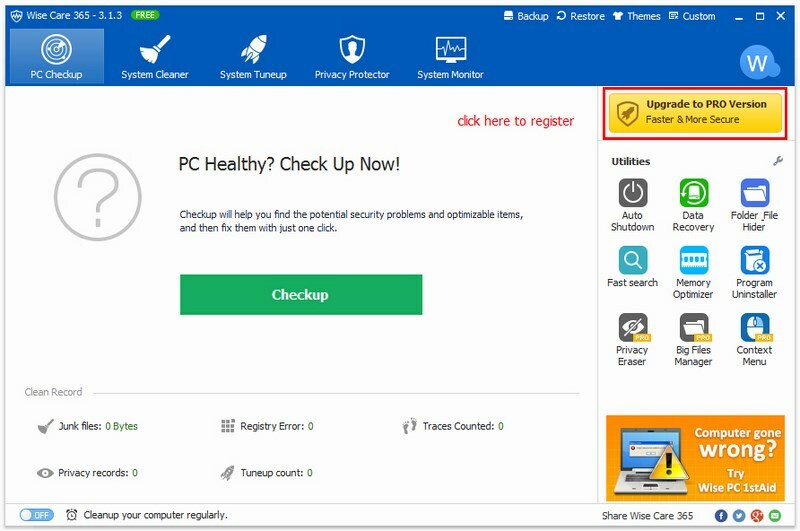 Disk Cleaner in Wise Care 365 quickly scans your disk to find junk files. Accurate: Using complex algorithms, Wise Care 365 accurately identifies obsolete registry entries and junk files. Secure: Wise Care 365 automatically creates backup files before deleting obsolete entries from your registry. 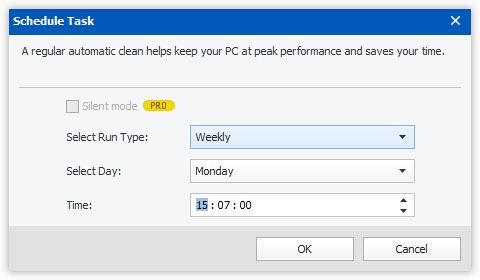 Wise Disk Cleaner provides two cleaning modes. 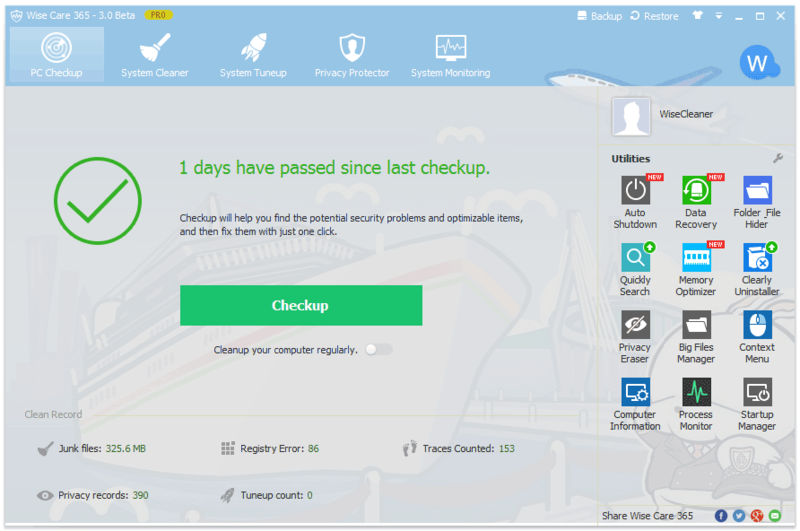 Ease of use: Wise Registry Cleaner and Wise Disk Cleaner come with a user-friendly interface. Even the least experienced user can easily use them. 3) Click “Full version” button on the upper right. 5) Enter your name, email, and your license key (copy & paste) in the form. 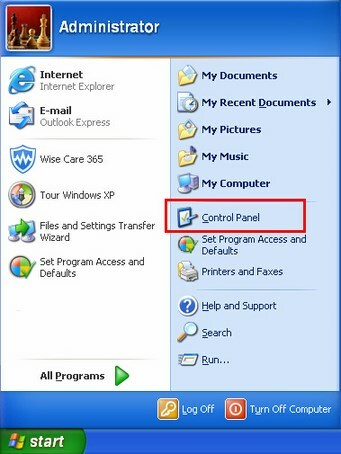 1) Right click Wise Care 365 Tray icon in Window notification area. If you cannot find it, please run Wise Care 365 first. 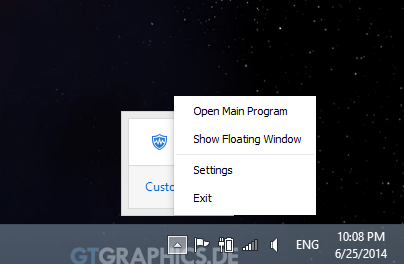 2) Click 'Show Floating Window', then it will be displayed on desktop. 6) Click 'OK' to save settings. 4) Click 'OK' to save your task. 5) Click items to expand, then Select/Deselect items which you want to scan and fix. 6) Click 'Save' to save settings. 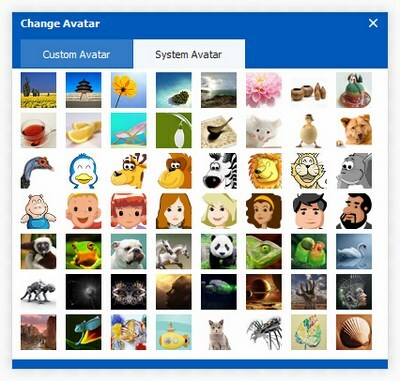 3) Click your favorite theme. 5) Drag the scroll bar can change theme effect. 1) Click Here to open the retrieve page. 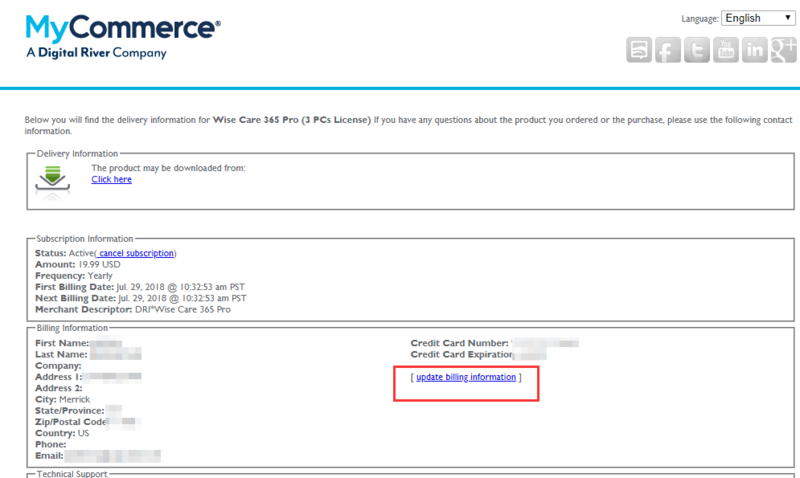 2) Select your product: Wise Care 365. 3) Enter the email address you used when you purchase the product. 5) Log in your email, check inbox and spam box. 1) Click Here to open renewal page. 6) When your payment is completed, your renewal is successful. Notice: You do not need to register again. We simply expand the expiration period of your license key. So please rest assured to use the present Pro one. 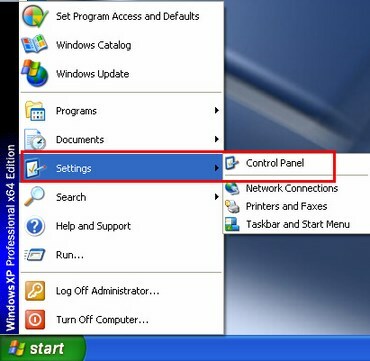 5) Click Save to save settings and close window. Next start, you will see the correct unit. The file WC365Portable.zip is the portable version of Wise Care 365. 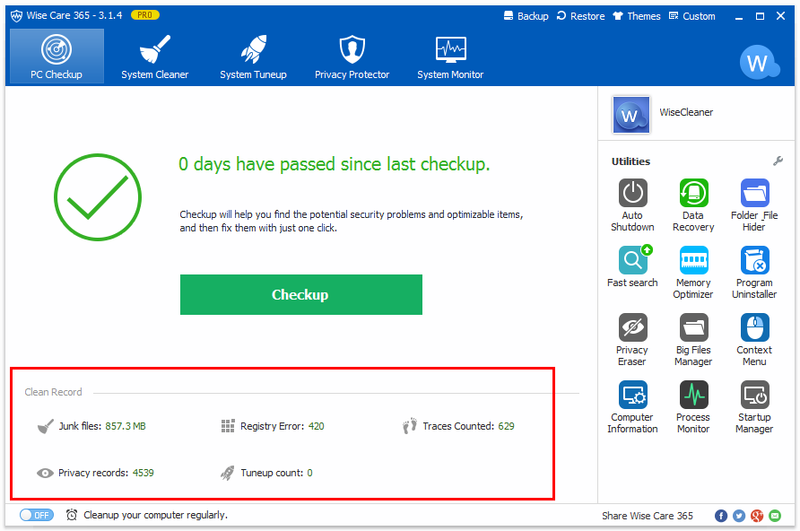 You can save it in removable device and run wise care 365 in other computer. 1) Download Wise Care 365 from download center. 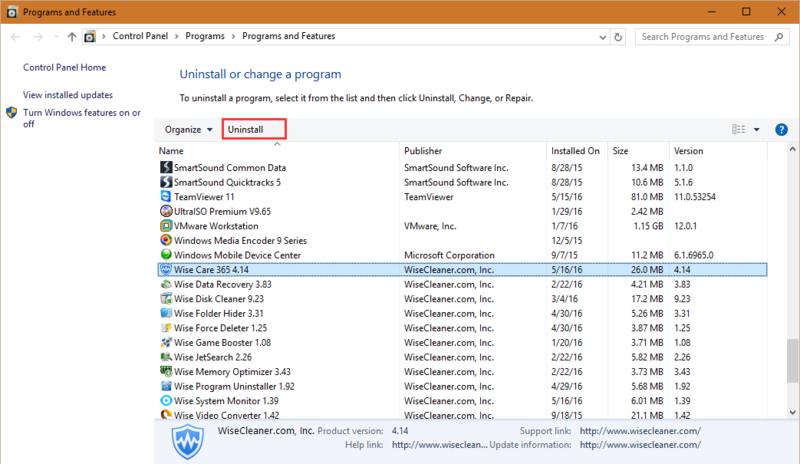 2) Find out the installer file (named WiseCare365.exe) and double click it. 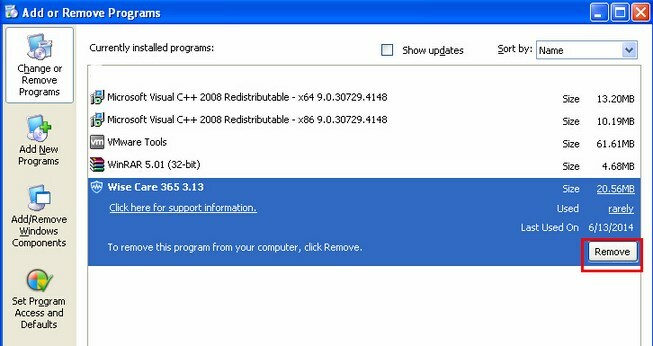 3) Then the installer will start automatically and will guide you through the rest of the installation process. 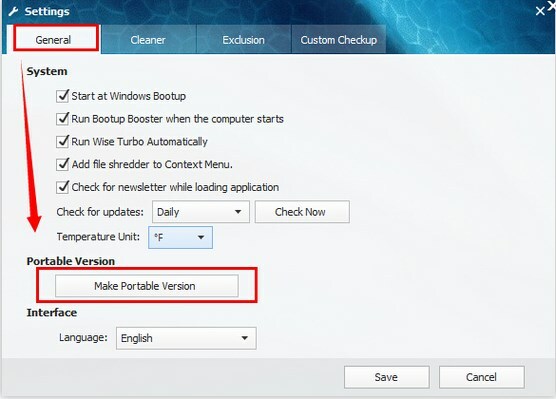 4) Click Remove and follow the prompts to remove the application from your computer. 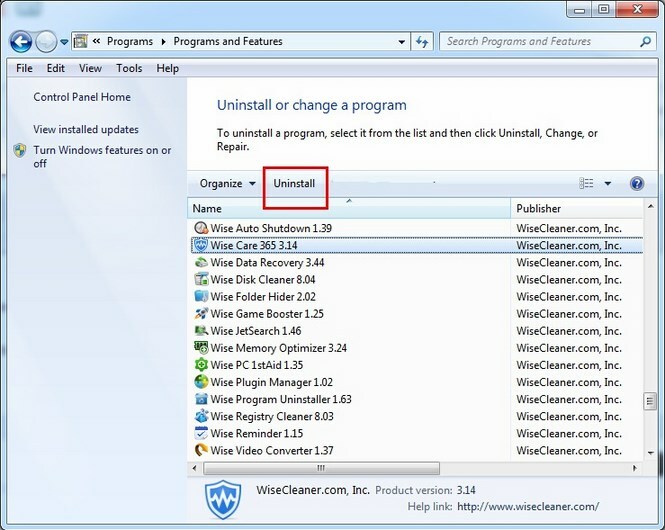 4) Click Uninstall and follow the prompts to remove the application from your computer. 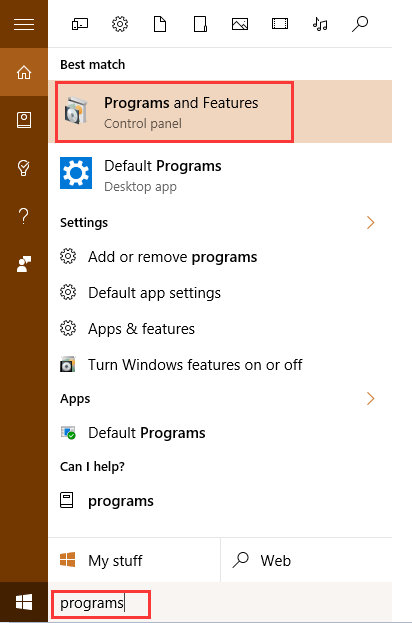 3) Click Uninstall and follow the prompts to remove the application from your computer. 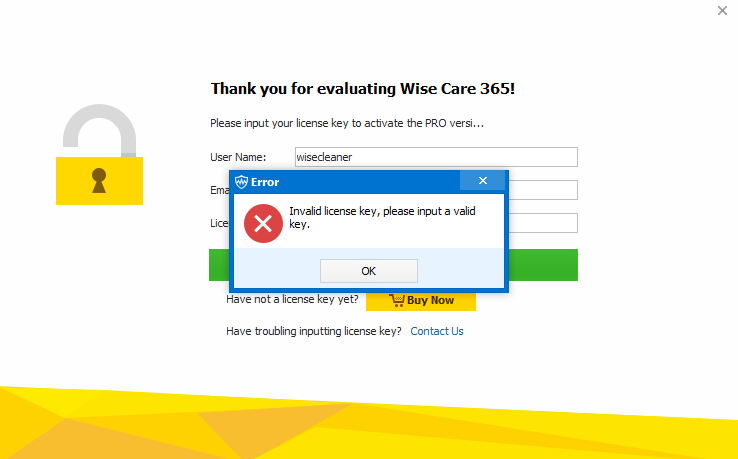 When you type license key in the form to activate wise care 365, you may get this error message "Invalid license key, please input a valid key." 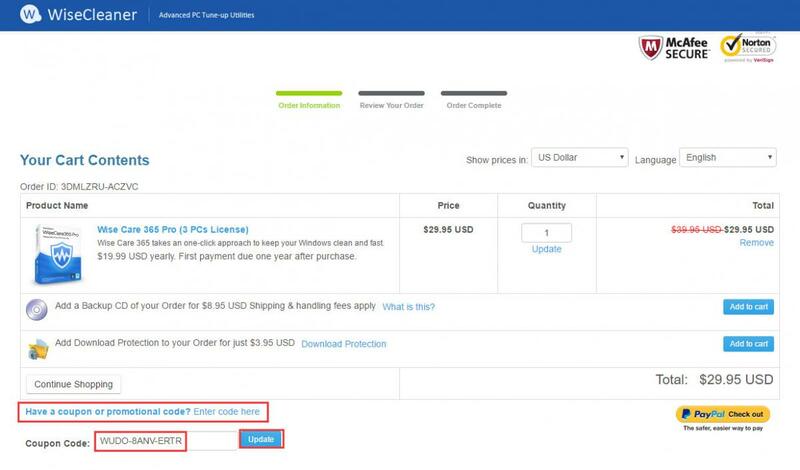 1) We suggest that you buy our software through official channels. 2) Please try copy and paste the key instead of typing letters one by one. 1) Please check your inbox and spam box firstly. 2) Sometimes the internet transfer delays. Please email us immediately if you haven’t got the key after 24 hours upon purchase. We will fix it for you asap. 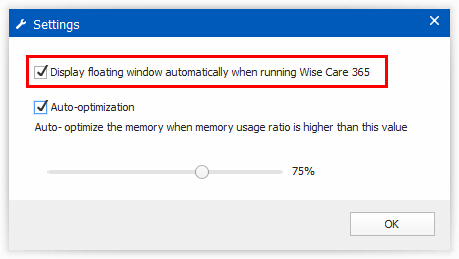 Does wise care 365 support my OS? 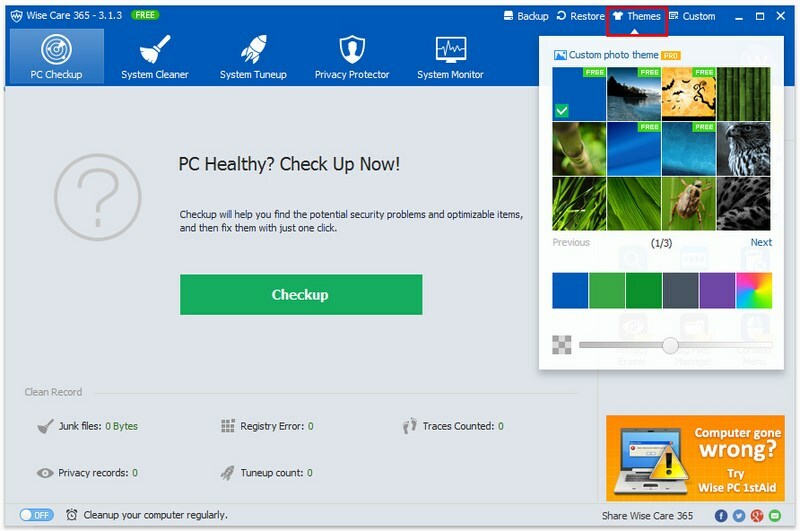 Since Wise Care 365 is a small and quick program, it takes less memory and needs fewer hard drive requirements. P.S. Wise Care 365 does not currently support Windows RT or Mac OS or Linux. About the items in "Clean Record"
Please don't misunderstand them as items left in your PC. The figures displayed there are a description of how much Wise Care 365 has ever cleaned for you. 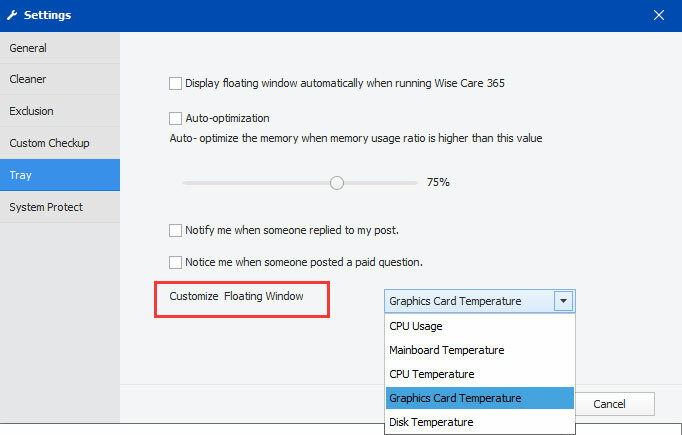 The floating window of Wise Care 365 is very useful, you can monitor system performance without opening the task manager. The floating window has two parts, the left part shows memory usage, and the right part shows temperature (CPU, Mainboard, GPU, Hard Drive). And it also can display CPU usage (but, this option is invisible). 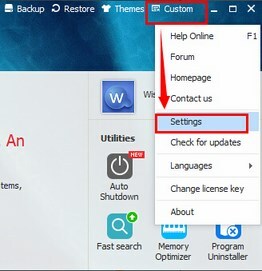 Open Wise Care 365 -> Menu -> Settings -> Tray, select which item you want to display. 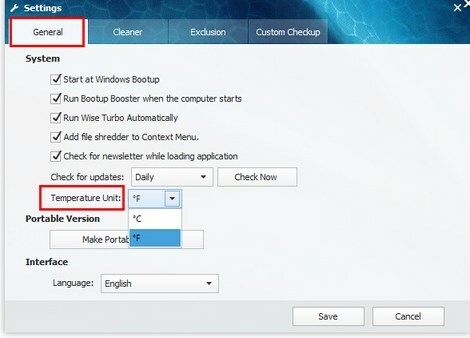 1, Change the displaying temperature device. 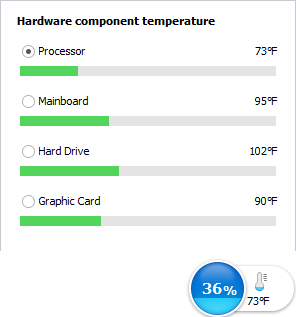 Just click on the right part of the floating window, then you will see Processor, Mainboard, Hard Drive and Graphic Card temperatures. selecting device which you want to display. a. Close Wise Care 365 and make sure the Wise Care 365 Tray is not running. 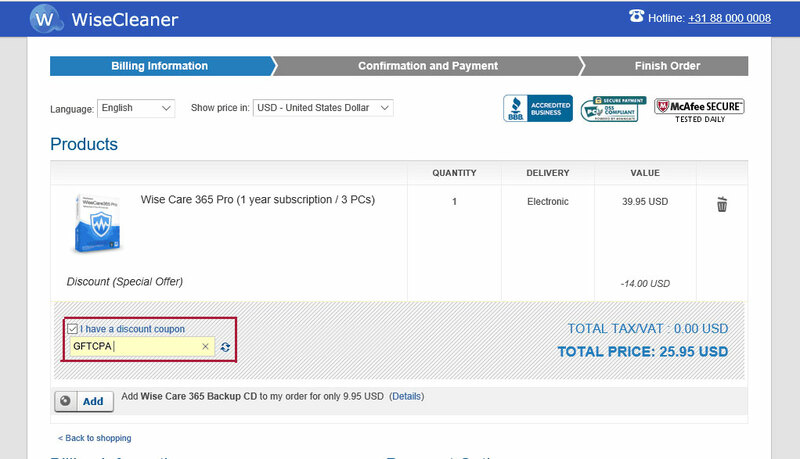 How to use the WiseClener coupon code? 1, When you get a coupon code, you should to confirm the coupon code belongs to / can be used in which platform. 3, In Regnow cart, you will see these words - Have a coupon or promotional code? Enter code here, under the Product name, it is clickable, just click it, then you will see a blank box, fill in your coupon code, do not forget to click Update button. After that, you will see a new total price. 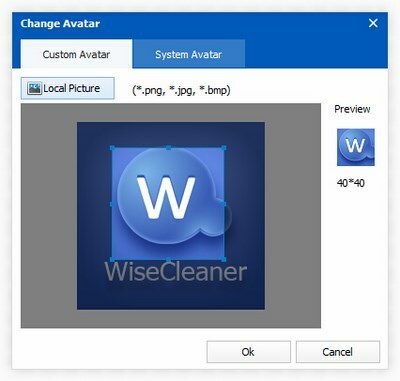 4, If your coupon code is Avangate, please email to WiseCleaner Sales team, tell us that you want to use avangate to purchase wisecleaner product, do not forget to tell us the product name/license type. 5, When you enter avangate cart, tick the option - I have a discount coupon, then fill in your code, and click the update icon. After that, you will see a new total price. 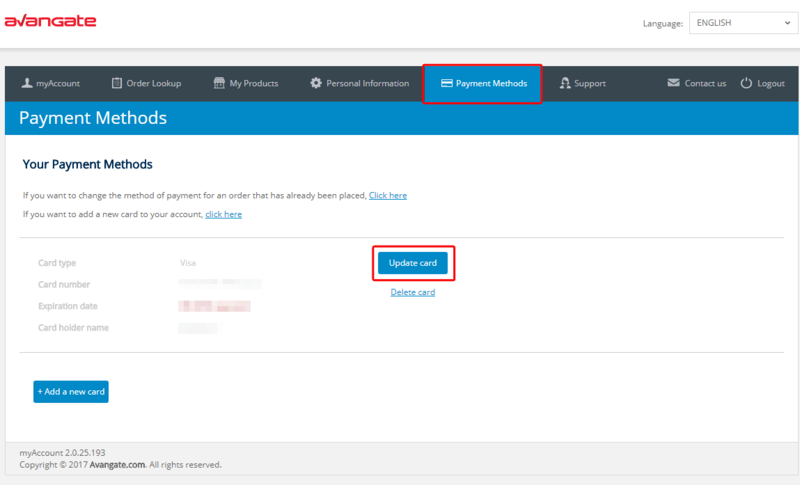 How to update my payment information? 1, Sign in your PayPal account. 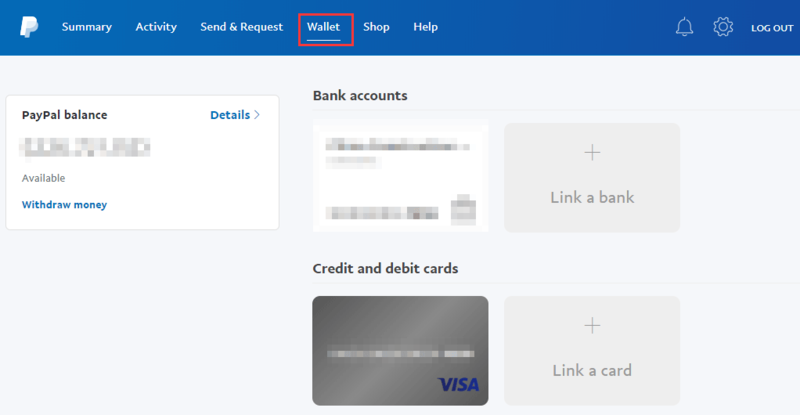 3, Click Wallet tab, you can update your Cards information. 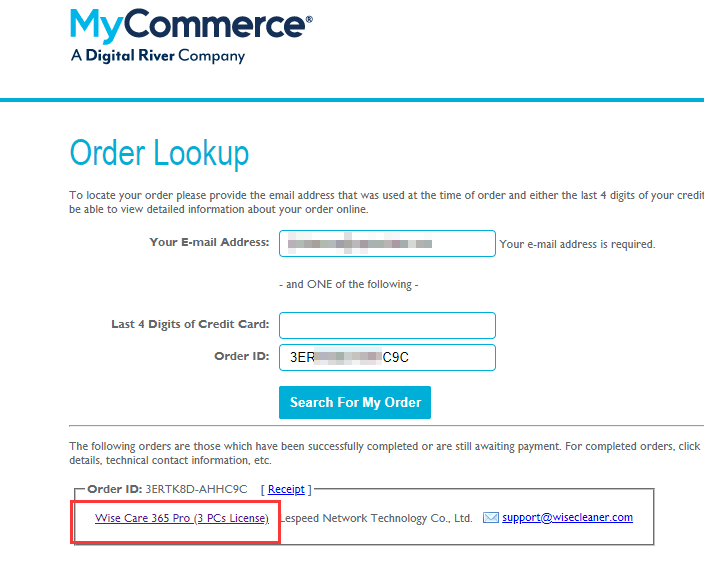 1, Open Mycommerce order lookup page. 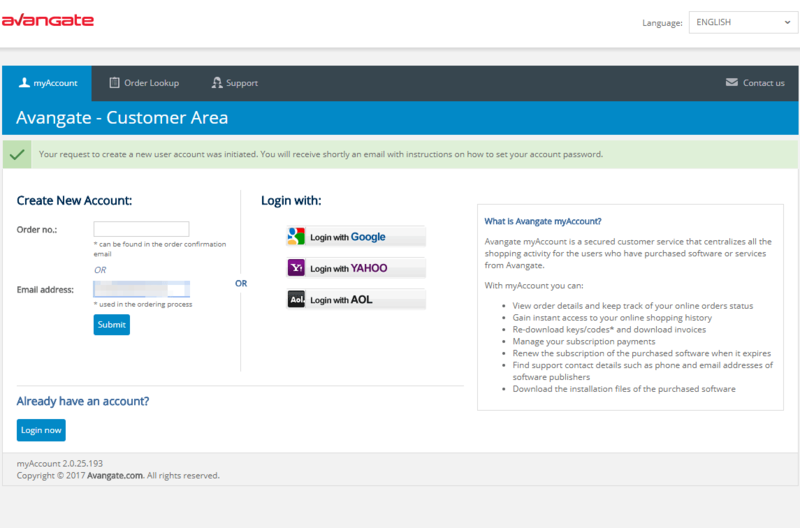 1, Open Avangate customer page.